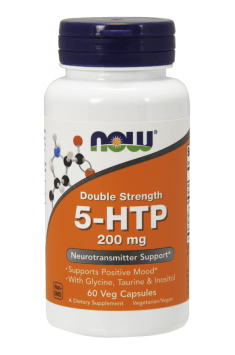 Now Foods Double Strength 5-HTP is a dietary supplement that includes a high dose of 5-hydroxytryptophan. It is accompanied by substances strengthening and supplementing its action, namely vitamins B3 and B6, glycine, taurine and inositol. The supplement supports the work of the nervous system, promotes the reduction of symptoms of depression, facilitates a stable and positive mood. Works well in the fight against insomnia and sleep disorders. In addition, it regulates the appetite and can reduce the appetite for sweets. 5-HTP (5-hydroxytryptophan) is a chemical compound belonging to amino acids, naturally produced in the human body from tryptophan. It is necessary for the synthesis of serotonin, and also supports the formation of dopamine, norepinephrine and melatonin. As one of the few compounds it has the ability to overcome the blood-brain barrier. 5-HTP strongly affects serotonin levels in the brain, which results in specific effects associated with the functioning of the nervous system. Thanks to the increase in the serotonin level, the mood and mental well-being improve. In addition, it is easier to control the emotions, and also restrain unjustified fears and anxiety. The right level of serotonin is important for one more reason - it allows you to create the right amount of melatonin. It determines the normal circadian rhythm and optimal sleep. For this reason, 5-HTP is ideal for people suffering from insomnia or sleep disorders. Vitamin B3 (niacin) has a significant effect on the work of the nervous system, shows soothing and calming properties. It supports the strengthening of cognitive functions and promotes mental fitness. Its deficiency correlates with a higher incidence of depression and insomnia. It is worth knowing that with a drastic decrease in niacin concentration, it is synthesized in the body from tryptophan, which often results in its deficiency and inability to produce the right amount of serotonin and melatonin. As a result, mood disorders and sleep problems may occur. Vitamin B6 (pyridoxine) is actively involved in the production of neurotransmitters that affect, among others, the mood and cognitive functions. Its deficit increases the risk of depression and anxiety disorders, causes problems with memory, makes it difficult to focus attention and promotes the weakening of intellectual performance. Leveling the amount of this vitamin has a positive effect on the quality of sleep and facilitates the fight against insomnia. Glycine is one of the endogenous amino acids, distinguished by its very simple structure and specific action. This substance is extremely active in the central nervous system, where it acts as an inhibitory neurotransmitter. It is also a co-agonist of NMDA receptor, thanks to which it optimizes glutamatergic transmission and can alleviate the negative symptoms of some psychiatric disorders (including schizophrenia). In addition, it has a beneficial effect on the mood and quality of sleep. Taurine is a non-protein amino acid naturally synthesized in the body. It shows neuroprotective properties and supports the strengthening of cognitive functions. It also has a positive effect on the nervous system, inhibits its hyperactivity, which results in reduced anxiety and over-stimulation. Inositol is a compound known as pseudovitamin, which works in a similar way to B vitamins. It is produced in the human body in small amounts. It is part of the cell membrane structures and is involved in the transmission of nerve impulses. Intellectual performance, the ability to focus attention, the speed of thought processes, and clarity of mind depend on its availability. Researches also suggest that inositol can increase the sensitivity of serotonin receptors, which would explain its positive effect on mood and antidepressant effects. In conclusion, Now Foods Double Strength 5-HTP is a broad-spectrum supplement. By increasing serotonin levels, it promotes mental well-being and alleviates depression and anxiety symptoms. In addition, it supports the fight against sleep disorders and insomnia. It is also recommended for people struggling with obesity, especially if it is due to overeating and unrestrained appetite for sweets. Double Strength 5-HTP 200mg 200mg 60 caps. The supplement contains a high dose of 5-HTP, so you should not take more than one capsule a day. Research shows that such a dose is enough to feel the improvement of mood and regulate the circadian rhythm. It is best to take it on an empty stomach in the evening. The supplement should not be taken together with antidepressants from the SSRI or MAO group. Combining them with 5-HTP may result in the development of a health-threatening serotonin syndrome. Hypromellose (cellulose capsule), Ascorbyl Palmitate and Silicon Dioxide.